Since I was sharing this image with others, I thought I'd share it here at Digilent as well. The attached image shows the frequency response of several FFT windows, including the well-known rectangle and Hanning windows. The blue window is one I've put together, but haven't shared the FPGA source code used to implement it. I challenge anyone to do better. 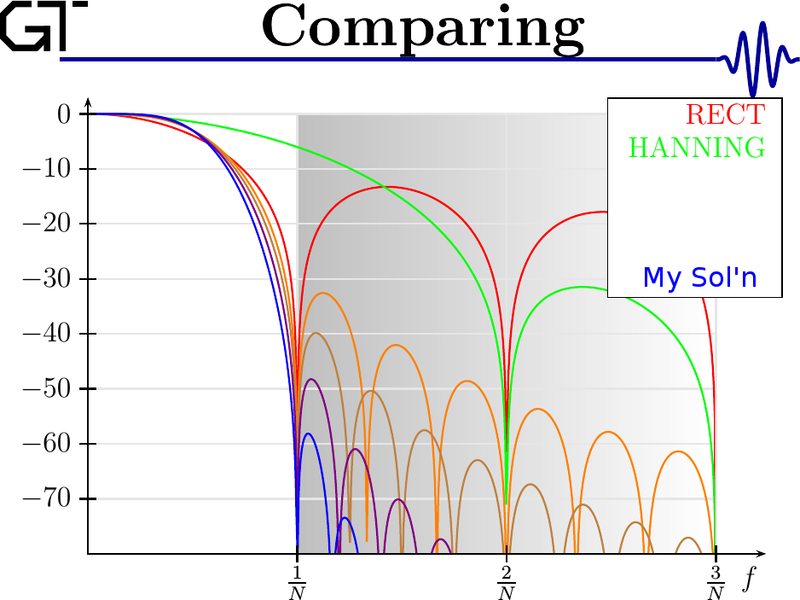 Oh, and one other comment ... all but the Hanning window can be used in an invertible FFT process. Your solution looks very impressive, regardless of its implementation! I think this is a great achievement, DSP-wise, to make sidelobes as small as -60dB!!! I would be really curious to see what was the trick behind your solution from the math point of view, if are willing to share. What, and give away my secrets before giving you a chance to try? The sad story behind the approach is that it's nothing new. It was invented several decades ago. (In the 70's, if I recall correctly) Further, and much to my dismay, my grad school DSP prof steered the class clear of this branch of technology, seeing that it wasn't new or in his favorite textbook. Then, to add insult to injury, when I purchased a text book for my own study of Time Frequency analysis, the author believed this class of approach to frequency analysis was thoroughly dead, choosing instead to use other quadratic transforms of the data ... transforms that created misleading artifacts where no time/frequency energy existed. That said, ... care to try your own hand at the problem? Hell yeah! It would be interesting to try it! I've never heard or seen anything like this and, therefore, I didn't think it could be possible either. Now, having a live example in front of my eyes, I'll try to dig in this direction. It's not just for curiosity, it might be very useful in my research as well (not an FPGA implementation, but rather the mathematical way of approaching this problem). If not, I listed a bunch of references, together with some filter statistics, on this page. Yeah, I figured out how you did this, but I didn't try to do it myself yet. However, I have big plans for this stuff in the future, it will be useful in my area. ... and thank you for the references! Yeah, the distance between the nulls sort of gives a lot of it away, now, doesn't it? Thank you for your nice and useful tease. Based on the plot one can figure out that it is time-varying estimation. I will try this later. Do you have any practical use of Wavelets in area other than video compression? As for wavelets, while I've studied them before and built things using them, I have yet to truly find them appropriate for any of the applications I've had to work on. That may just say more about the applications I've worked on than anything about wavelets. Thank you D@n, I always find something useful for me.